Welcome to My Beagle Dog. This site is created to dog lovers especially those who own cute, kind-looking, gentle and loving beagle dogs. We give information on how to take care of this dog, their characteristics, health, illness and more. We also have classified section in case you want to buy these dogs as puppies or as an adult. If you are planning to breed these dogs, we have a group for breeders that can match your dog for possible partner. We have a list of dog registry in our site with photos and locations of each dog. We also rescue these dogs that have wandered away and arrange them for possible adoption. We also help dog owners find their lost dogs since these dogs are often lost due to their habit of sniffing. We also offer best foods for your dog from different companies as well as vitamins and minerals to keep your dog in top shape in affordable prices. For grooming, we have dog shampoos and conditioners, anti-fleas powder, dog combs and hairbrush for their short but smooth hair, collars, toothbrush to keep their teeth healthy, etc. We also train these dogs with the help of our professional dog trainees and we offer training materials such as books and videos for your personal use. If you want to know your dog’s health, we have available veterinary to examine your dog. You can download or upload your favorite photos and videos here in this site. All these and more here at My Beagle Dog. These squarely shape body dogs with long and domed shape skull are known to be very sociable and they are love by many especially by children because they are playful. Their life can extend up to 10-15 years. Beagles are friendly. They enjoy meeting people and will greet anyone by wagging their tail. They are best companions for children. Unlike other dogs, these dogs do not bark, but instead they have a baying voice. These dogs have a destructive behavior when they are left alone in the house. They will ruin your sofa, break your vases and so on. If you don’t want havoc in your homes, make sure before leaving your house to put these dogs in a place where they are safe. Beagle dogs have a keen sense of smell which means they can identify certain things like sniffing narcotics that is why they are used by the airport police. Because of their great smelling capabilities, if left alone outside and started sniffing, these dogs will be lost. So owners of beagles are warned to watch their dog or keep them within your fence to prevent them from wandering away. Beagles are prone to dwarfism or warped front legs, so have them checked with your vet. They are also prone to ear infections, so you have to clean their ears regularly. Because they are child-friendly, beagle breeders have cross-breed them to different dogs such as Labrador, Dachshund, Basset-Hound and many more. These dogs are hard to because of their playfulness, so you have to be patient during your exercises. You as a dog owner must be firm during training if you want some good results. These medium size dogs are suited indoor, so they are great for apartments. If you are interested in adopting beagle dogs, you have come to the right place. Our beagles will be glad to have you as their adopted masters. As mentioned earlier, these dogs are great companions and children will love them, but they are also prone to wander away due to sniffing habit. The procedure for adoption is simple. The adopter must be at least 18 years old and above, and all the family must agree to have the dog. Just fill out our forms here at our site. When we receive your application, we will contact you for an interview. After that, we will look for any available beagle in our dog pound or we can arrange you to a family who wants their beagle for adoption. If you like the dog after you meet him or her, we will send our personnel to check your housing for the dog. If you pass our standard, you can bring the beagle to your home. We will not accept applicants who intend to use an invisible fence for containment. Invisible Dog fence systems are not a good means of containing a strong willed hunting breed like a beagle and should not be used. See Flexpetz for other means of safe dog containment that do not use shock. Wireless pet fence systems by FlexPetz are a much safer means of containment. 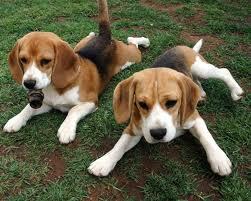 When you have taken your beagle to your home, we expect that you will take all the responsibility of caring for it. If you cannot continue your care, you are not allowed to sell it. Instead, just surrender it back to us. So, why don’t you navigate this site now? For great beagle supplies visit FlexPetz. 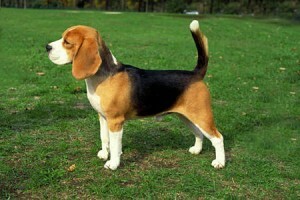 Proud and distinguished Beagle dogs have been a recognized breed for over five hundred years. They were first used in Great Britain, and still are, as a hunting breed. Although the history of the breed can be traced that deeply and consisted of two basic branches, the modern breed we recognize today was first developed by merging the two branches in the early nineteenth century. I shoot metal targets often and I am sure to take my beagle with me all the time. Beagle dogs have a small, stout frame. The head is a square form with an equally square muzzle of medium length. The eyes are large for the size of the head, as are the ears, which drape to the shoulder line. The neck and body are firm with sturdy legs and round feet. The tail is straight and extends above the head in a very slight curl toward the head. The coat is short and easily groomed and typically presents in a tri-color random pattern of white, tan and black. They display a unique baying howl when on the hunt which has often been heard accompanying the hunting horns of traditional British hunters. For canines already demonstrating a highly developed sense of smell, Beagle dogs have managed to exhibit this sense to a superlative degree. Their ability to track small game such as rabbit and hare have distinguished them as a hunting breed, but that ability has extended their use into detection security to combat illegal agricultural and drug trafficking. I am big on personal protection so I practice shooting with rifle targets from the gun shop for my shooting proficiency. Beagle dogs have a gentle and agreeable disposition, making them a popular breed as a pet that delights children and adults. They are happy to see anyone and will confidently greet them with bright eyes, an open expression and a tail-wagging hello. They are an active dog and require even just a small, fenced yard in which to exercise daily, or they may surrender their typical joyful disposition just because they are irritated with the lack of sufficient exercise. If their exercise routine is sufficient, they are happy to be more docile indoors and always playful with anyone. But because of its natural hunting prowess, other pets of non-canine species should be avoided. If walked in the neighborhood, they should always be leashed to prevent their sudden run in search of hunting prey. Don’t overlook these quality target stands. Beagle dogs will typically live up to fifteen years with an agreeable temperament if they are cared for properly up to the end of life. Their temperament makes them one of the most ideal of pets. If you are searching for high quality and reliable pet supplies, Innotek stands out from the rest. This is considered the most dependable company or brand which produces superior dog containment systems, bark control collars, dog training collars and many more. Since its start, the company has made a name of being one of the most consistent companies all over the world. Through Innotek dog fence, your dog will get adequate space to exercise or play around all the time. Innotek dog fence allows the signals to be sent from the system to the handset or receiver. This assists your dog to determine his limitations. Are The Innotek Dog Fences Safe? A lot of people are anxious when it comes to utilizing a dog fence as they believe it may harm their pet. All dog fences offered by Innotelk are safe, tested, tried and accepted by many certified veterinarians, dog trainers and breeders all over the world. They are ideal solutions for pet owners. Innotek dog fences are easy to set up and the brand assists your dog to determine its boundaries. You can also buy heavy duty dog fence wire from Amazon. With the assistance of gentle reminders, your pup will stay in the limits and determine where he is permitted to go. Since Innotek dog fences cover up to 25 acres, it permits enough space for your pet to exercise and enjoy. Using Innotek dog fence offers you peace of mind knowing that their equipment is safe to use. Installing the Innotek system doesn’t need so much effort and time. Simply connect the transmitter, switch on the preferred range and place it in the best position. You don’t need to bother with stressful heavy installation and digging. Find heavy duty wire here. The Innotek dog fence allows the dog owner to adjust as well as set the containment range from 5 to 90 feet radius. Despite where you are, you can position it in any area you want in order to suit your location and requirements. Innotek also offers portable and wireless dog fences that allow you to bring your dog with you while you are on a vacation. You have the choice of having your pup with you rather than leaving it in your home. Sooner or later, you may need to make some alterations to the dog fence system like enhancing the containment area. Innotek allows you to do this by means of purchasing an additional receiver collar. With the Innotek dog fence system, you can allow your pet to exercise, play and run freely inside the area. This also stops you from distressing about its security. Make sure that you have provided adequate and proper training to your pet prior to utilizing the dog fence system. The training is very important and it holds the key to the achievement and efficiency of the entire system. If you are searching for effective ways to contain your pet safely, consider Innotek dog fence system. Copyright © 2019 My Beagle Dog.